permanents will also be shown using the Nyx card frames. In addition, 2 bugs were fixed and 166 cards added. Please help. Updated java to the latest version. But when you start Magarena.ex, a small game window will appear, then my desktop and that's it. Windows 10 pro, v.1803. Smollett wrote: Please help. Updated java to the latest version. But when you start Magarena.ex, a small game window will appear, then my desktop and that's it. Windows 10 pro, v.1803. This window slips and that's it. It seems to me that this is my problem. I can't run any jar file. I tried everything, even reinstalling windows. I do not know what else to do. @Smollett I've made some changes to fix the bug, unfortunately I don't have a Win 10 machine to test it on. 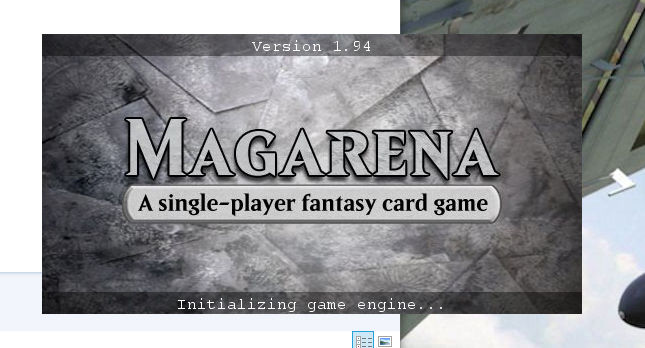 You can find a patched Magarena.jar file at https://keybase.pub/melvinzhang/magaren ... garena.jar You should override the Magarena.jar file in your install directory with the patched one and trying starting the application. If it fails, please attach the crash.log file here. melvin thanks for the help. Problem solved. Put it on top. It worked after I placed the game folder in the root directory of the disk. Although it was deep in the tree, it did not work. Smollett wrote: melvin thanks for the help. Problem solved. Put it on top. It worked after I placed the game folder in the root directory of the disk. Although it was deep in the tree, it did not work. Good to hear that. Did you mean it worked once you changed the folder to a different location or was that after you replaced the Magarena.jar file with the fixed one? I'm trying to figure out the root cause of the problem so we can fix it once and for all. There shouldn't be any issue placing the game folder anywhere on your drive, it doesn't have to be at the root directory. Could you help to me to test this: put the game folder back where it used to crash, then override the jar file with the patched one I provided in the earlier reply and trying running it this way. Does it start? Yes sir. When my jar file is located, for example, (G: \ MTG! /Magarena-1.94/Magarena.jar), this does not work. And if in (G: / Magarena-1.94 / Magarena.jar), then everything works. Smollett wrote: Yes sir. When my jar file is located, for example, (G: \ MTG! /Magarena-1.94/Magarena.jar), this does not work. And if in (G: / Magarena-1.94 / Magarena.jar), then everything works. Thanks for including the directory, it clears things up a bit. It looks the ! in your directory name could have confused the program. That is a bug which should be fixed in the patched jar file, but unfortunately I'm unable to test it myself. Please try using your original folder (G:/MTG!/Magarena-1.94/Magarena.jar) but with the patched jar file I provided in the earlier post. I'm trying to find out if my changes fixes the problem of not being able to use a directory name containing ! on Windows. Your modified jar file did not help. But I repeat, I have all the other jar files, they also work only from the root folder. No Magarena. Perhaps this error is only mine. Smollett wrote: Your modified jar file did not help. But I repeat, I have all the other jar files, they also work only from the root folder. No Magarena. Perhaps this error is only mine. Thanks for the confirmation that it did not work. I did some additional digging and it is a Java bug (see https://bugs.java.com/view_bug.do?bug_id=4523159). The limitation is that the directory name cannot end in !. So for example if you have an MTG directory, and you install to G:\MTG\Magarena-1.94\ it will work fine. Thanks for your help in figuring out the issue. Thanks for this tip. I lost a few days )). Who would have thought that all this is connected with the symbol (! ).